Barbara Glacel quickly gains the trust and respect of people at all levels in an organization. This allows her to help a work group understand the true root cause of problems and to develop solutions that have a high degree of acceptance. 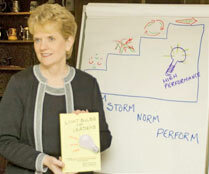 Light Bulbs for Leaders®: A Guide Book for Team Learning is part novel, part workbook. Brimming with insights, ideas, tools and step-by-step guidelines, this guide book helps teams master the skills needed to overcome impasses in the team learning process and then achieve ever higher levels of team performance and productivity. Described by Jim Kouzes, best-selling author of The Leadership Challenge: "Light Bulbs for Leaders is two books in one - a compelling story of the lessons we can learn from organizational life and a leadership handbook on how to guide teams along the path to performance. It's a delightful read about a subject made boring by far too many. 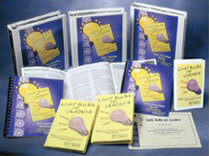 Plug into this tale of teams and leaders and your light bulbs are sure to gleam." The Light Bulbs for Leaders® Team Learning Workshop takes participants on a two-day journey into uncovering solutions to such commonplace problems as turf battles, hidden agendas, withholding information, and conflicting priorities. Experiential activities followed by team discussion allow team learning to occur as participants reflect on their own experience in the work place. For more information about real-time team learning in your organization, contact us at: Coach@glacel.com. The Light Bulbs for Leaders® Team Assessment Survey gather information from intact team members on how they use their time together, how differences are expressed and conflicts resolved, what norms for participation are established, and how results are achieved. This specific information provides the backdrop for team members to share feedback with one another and plan for improved team learning and results. The Light Bulbs for Leaders® Team Learning Experience exercise provides participants an opportunity to succeed at working together in small groups. Using the well-known four-stage model of team development, participants link theory and practice as they analyze team processes. In reflecting on their team experience, they gain insight into how individual behavior impacts team performance. The Light Bulbs for Leaders® Video presentation brings to life the fictional learning team that must turn around its company's performance. Seeing this team in action allows viewers to identify with their own team learning behaviors and progress. These products are available from The Glacel Group. Contact us at Coach@glacel.com. This book is an academic assessment of the evolution of governmental policy over a decade leading to the formation of innovative public institutions in the form of regional transit authorities in Massachusetts outside the Boston Metropolitan area. Using a systems framework of analysis, the book assesses the forces leading to legislation and then the impact of the new institutions on social, political and economic environments. The inter-connectedness of business, politics, and social needs is examined in detail. Despite the fact that over 190,000 women in the U.S. alone will be diagnosed with breast cancer each year, no doubt each one will feel quite alone, afraid, and at a loss when faced with such a devastating discovery. In Hitting the Wall: Memoir of a Cancer Journey, these women will find a wise and comforting companion to guide them during this difficult time. Author and breast cancer survivor Barbara Glacel uses her own well-documented experiences to encourage and empower others to take control of many aspects of their treatment. 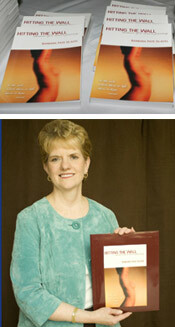 The resources she gives and insights she reveals are invaluable to those determined to fight this disease. Written not just for the cancer patient, but also for her loved ones and caregivers, Hitting the Wall shows readers how they, too, can refuse to give up or give in when threatened by this intimidating disease – and reassures them that they are not alone. For more information, visit the Hitting the Wall website.